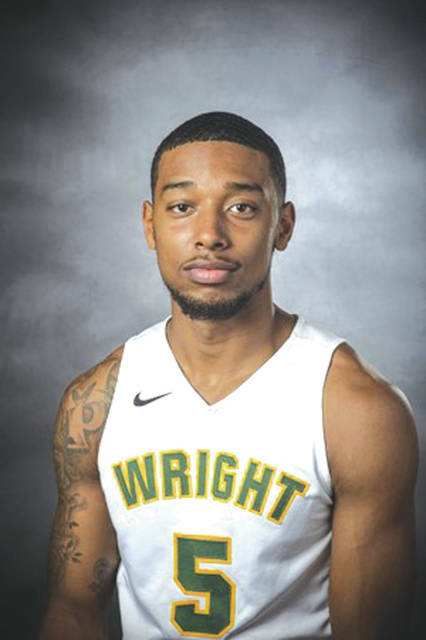 INDIANAPOLIS — Skyelar Potter, a 6-foot-3 guard for the Wright State University men’s basketball team, has been named the Horizon League Freshman of the Week, conference officials announced Nov. 19. Potter, a native of Bowling Green, Ky., averaged 13 points and nine rebounds for the week after a double-double against Toledo with 13 points and 11 rebounds, adding 13 points and seven rebounds against North Florida. For the season, he is averaging 10.8 points and 6.5 rebounds with seven three pointers. The Raiders, 3-1, will play Tuesday, Nov. 20, against Penn State in the Cancun Challenge at 8:30 pm. in Cancun, Mexico. WSU will end its trip with either Southern Methodist or Bradley, on Wednesday night, Nov. 21. 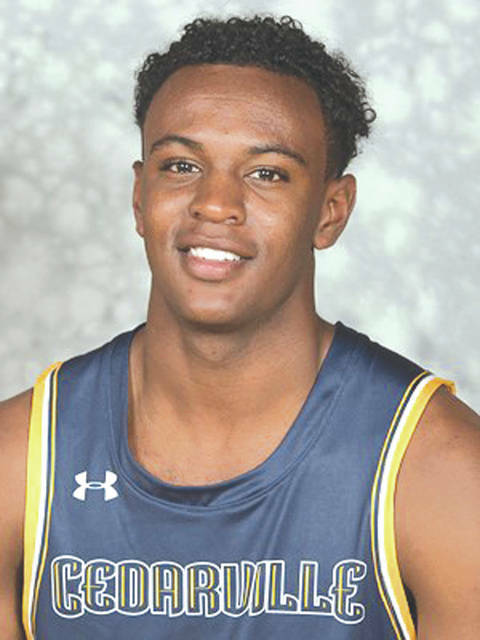 INDIANAPOLIS — Cedarville University freshman Branden Maughmer was named the Great Midwest Athletic Conference men’s basketball Athlete of the Week,it was announced Nov. 19. Maughmer, from Chillicothe, averaged 24.5 points per contest in the Don Callan Classic, which was held at Cedarville University. He scored a career-high 30 points in the Yellow Jackets’ 80-79 loss to Shawnee State, and tossed in 19 points in CU’s 112-69 win over Campbellsville-Somerset. Cedarville (2-2) plays at Kentucky State next, a noon contest on Tuesday, Nov. 20 in Frankfort, Ky.
East Lansing, Mich. — Taylor Mackenzie scored a team-high 19 points, Michal Miller scored 14, Emily Vogelpohl finished with 11 points, and Symone Simmons had a team-best eight rebounds to go with her nine points for Wright State, but host Michigan State had grabbed a 45-33 lead by halftime and never trailed the rest of the way, Nov. 18 in a women’s college basketball matchup. The Spartans’ Shay Colley led all scorers with 21 points. The Raiders will be in Nashville, Tenn., Nov. 23-25, in the aptly named Nashville Tournament. Wright State (1-3) will take on Hoftstra at 3:30 p.m., Friday, Nov. 23. Saturday’s Nov. 24 contest will pit the Raiders against Stetson for a 1 p.m. matchup, then Marist will face WSU to wrap up the tourney at 3:30 p.m. Sunday, Nov. 25. WILBERFORCE — Dwight Richards, Jr. scored a season-high 31 points, Dorian Crutcher scored 17, Malik Fisher knocked in 13 points while snaring 11 rebounds, and Tom Johnson passed for 14 assists, 11 points and eight rebounds as the Central State University men’s basketball team claimed its first win of the season, a 107-84 home win Nov. 18 over Ohio University-Eastern. The loss was OU-Eastern’s first of the season (4-1). CSU will play its first Southern Intercollegiate Athletic Conference game of the season for its next game, a 3 p.m. Saturday, Nov. 24 contest in Albany, Ga. against host Albany State. FAIRBORN — Six members of the Wright State University men’s basketball team contributed double-figure scoring to a 89-72 home win, Nov. 17 over North Florida. Loudon Love led the Raiders (3-1) with 20 points, Bill Wampler scored 17, Skyelar Potter added 13, Parker Ernsthausen 12 with Mark Hughes and Cole Gentry scoring 10 each in Saturday’s afternoon game at the Nutter Center. WSU heads to Cancun, Mexico to compete in the Cancun Classic. The Raiders open up with Penn State at 8:30 p.m. Tuesday, Nov. 20. Depending on the games’ outcomes, the Raiders will play either Southern Methodist or Bradley at 6 or 8:30 p.m. on Wednesday Nov. 21 for the second game. College cross country results will be a part of Wednesday’s Nov. 21 editions. Send local sports news and team scores to sports@xeniagazette.com.